Free-Range Parenting: Is it Too Scary to Consider? How would you feel about letting your child go to a neighborhood park to play on their own? Do you allow your children the freedom you had growing up? I think we would all like to do that – but realistically speaking – isn’t it too dangerous? Some people say — no. As I was doing research for my last post, I stumbled upon a few articles that included thoughts and opinions, on Free-Range parenting. I had heard about it, but didn’t know the specifics. What I did know, was that columnist Lenore Skenazy, made the decision to let her 9 year old son navigate the New York City subway all on his own. This of course was after she made sure that he knew about the subway system and could read a map. Skenazy then wrote about it in the New York Sun. Some people – I’m going to guess there were quite a few – thought she was crazy and that she was taking a huge gamble with her child’s life. At first, I thought so too and it had a lot to do with something that happened last summer. While the actual event only lasted a few minutes, it felt like an eternity. It terrified me and left me shaken for the rest of the day. I took the boys – who had just turned 3 – to a nice park on the other side of town. It’s one of our favorites, has wide open spaces, and a really fun playground. When we got there I heard music. There was a man playing a guitar and singing. He was located in the covered picnic area, which is right next to the playground. Right away my “mom radar” went off. I told myself that I shouldn’t be so judgmental and I just needed to relax a little. I sort of did — but I was careful to kept an eye on the guy and an even closer eye on the boys. The boys were playing and having a great time. There weren’t too many people there, so they had free run of the place. A. had climbed a little too high for his comfort and asked me to come help him get down — so I did. When I turned around to look for N. he was no where to be seen. No where! I tried not to panic. I kept one hand on A. and began calling for N. I looked all over. I looked on slides, on the swings, in tunnels and nothing. Then I saw something that made my heart sink and almost brought me to tears. The man – the one playing the guitar – was gone too. Suddenly, every episode I had ever watched of America’s Most Wanted and Dateline NBC – relating to abducted children – flooded my mind. I imagined that man had grabbed my son, and slipped away unnoticed. I tried to stop thinking about it, but I couldn’t. Now — I was frantically calling. A. began asking where N. was and started to call for him too. All of a sudden, from around a corner, came my sweet- faced darling boy. I’m getting teary just reliving this again; that’s how much it frightened me. I grabbed N. and hugged him and thanked God that he was okay. So after that experience – and the panic and fear that I felt – how could I even think of (eventually) giving them the kind of freedom Skenazy advocates? Well, she and others like her, think that shows – like the ones I just mentioned – are what keep us over parenting our children. 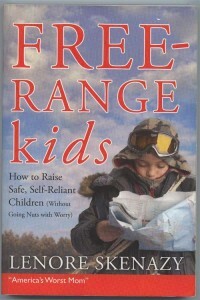 Skenazy also notes in her book Free-Range Kids: How to Rise Safe, Self-Reliant Children (without going nuts) that the occurrence of children who are abducted, is actually quite rare. Rare or not, I think I would be a nervous wreck if I allowed the boys – at age 9 – to ride their bikes to the library all on their own. Would they be fine? Probably, but what if they weren’t? I would never ever forgive myself if something happened to them. I have been reading Skenazy’s blog and I really like it. I didn’t think I would. I thought I’d be outraged by everything she posted, and I’m just not. She is right that hovering and trying to remove all of the potential dangers and disappointments in life — isn’t doing anything for our kids. So what if they fall down and get scraped knees or a broken bone? It’s going to happen but they will heal and they might learn to be more careful next time. So what are your thoughts? Are you for or against Free-Range parenting?